ALEXANDRIA, Va. , Apr. 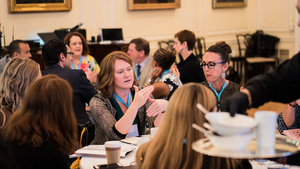 15 /CSRwire/ - The Charities@Work 18th Annual Employee Engagement Summit June 12-13, 2019 in New York City just announced the initial speaker line-up. This year’s topics include a fireside chat: sparking social change without getting burned; the new frontiers in diversity and inclusion; integrating employee engagement and employee resource groups with CSR; and more. Alex Cunningham, Senior Advisor, Global Social Investment at Chevron U.S.A. Inc. Since last year’s Emerging Leaders preconference sold out quickly, this year’s Summit is offering two pre-conference tracks: professional development for emerging CSR leaders plus a new “shark thank” for seasoned CSR professionals to tackle tough challenges such as increasing employee engagement and participation and measuring tangible impact. The preconference includes a volunteer activity packing 10,000 meals with Rise Against Hunger led by Dezarie Mayers, Senior Manager of Corporate Responsibility at Pfizer, Inc. who leverages these opportunities to engage employees and demonstrate tangible impact at Pfizer. To discuss sponsorship opportunities, please contact Amanda at info@charitiesatwork.org. Charities@Work (Charities at Work) bridges the corporate and nonprofit sectors to achieve greater social impact. Charities@Work is an alliance of three nonprofit organizations – Community Health Charities, EarthShare and Global Impact – that collectively represent more than 3,000 of the leading health, environmental, international development, and community nonprofits making a difference in the U.S. and around the world today. These nonprofits exist to facilitate interaction and partnership between charities, companies, and their employees for meaningful outcomes and impact for all.